Zambia Environmental Management Agency (ZEMA) formerly Environmental Council of Zambia (ECZ) has the mandate to do all such things as are necessary to ensure the sustainable management of natural resource and protection of the environment, and prevention and control of pollution. It is to this effect that the agency operates an Information and Documentation Centre (IDC) to furnish our members of staff and clients with the necessary information to carry out our mandate. The IDC falls under special libraries which means it provides specialized information resources on a particular subject and serves a specialized and limited clientele. It is for this reason that our library only admits clients that are studying or researching on environmental related subjects and admission is free. The collection is purely an environmental one covering subjects such as; environmental planning, climate change, biodiversity, fresh water resource, waste management, pollution, sanitation, soils, environmental law, agricultural practices, environmental monitoring, agro-industry. We also have a collection of our annual reports and various district state of environment outlook reports and many more documents both local and exotic. National policy to the environment. National strategy to reduce deforestation and forest degradation. Kafue flats status report: monitoring the pulse of blue heart of Zambia’s economy. Integrate d land use assessment phase II (2011-2016) Final report 2017. Biodiversity Diversity and Protected Areas. 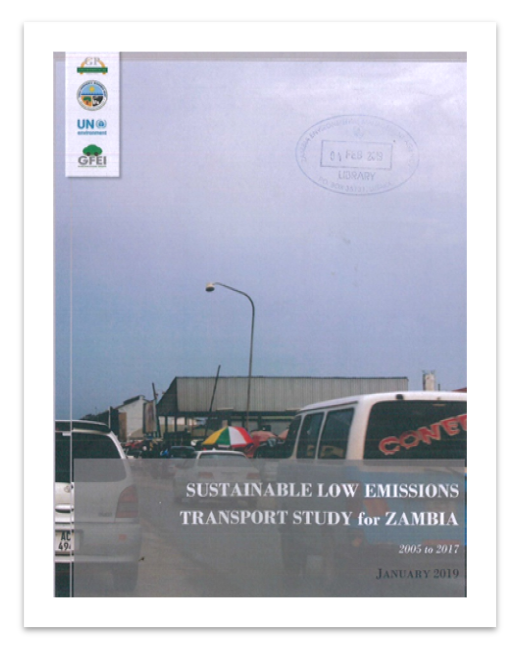 Published by ZEMA in collaboration with UNEP and others. This report consolidates findings of works by ZEMA and partners and provides an in-depth analysis of the national motor vehicle database, especially the trends driving the growth of light duty vehicle fleet. The objective in this study was to understand how the interventions if any, affected the motor vehicle fleet and consumer choice and behavior. The current database of motor vehicles in the country does not record eco-data (ecological data related to emissions, such as Carbon Dioxide per distance travelled or quantity of fuel consumed per distance travelled). There is no systematic deregistration of decommissioned vehicles. Importation of newer vehicles is only indirectly promoted by dis-incentivization of alternative through a one-off flat tax called motor vehicle surtax. There is an annual charge for emissions applied in a staggered manner. A mandatory standard exists regulating emission levels from motor vehicles exhaust pipes however, data to operationalize it is not collected. There is no indication of continuous improvement in the fuel standards. It is hoped that by following closely the trailing indicators discovered in this work, the next interventions can be structured. You can use this form to request for Books or Articles in advance from our Information and Documentation Center (IDC) before you visit. This will enable us to serve you better. When you visit the IDC on your submitted Date of Request, kindly avail your reference number.